Katie Fyfe | The Journal Gazette Huntington North senior Hank Pulver goes to the basket against the defense of Norwell junior Will Geiger during the first quarter. The Vikings, on the other hand, didn't play perfectly, but they did hold the Knights scoreless for the first 14 minutes of the game and built up a large enough lead to cruise to a 48-32 victory. 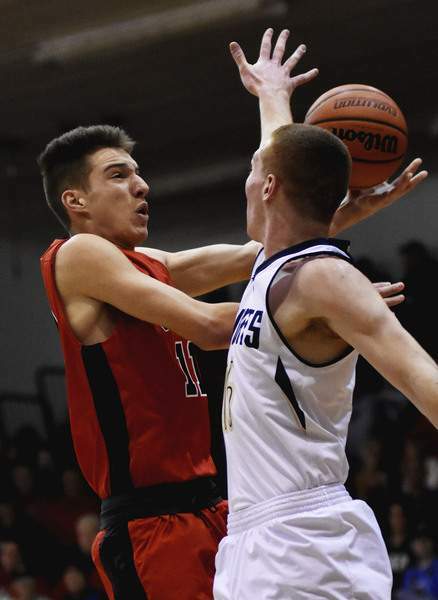 “We let them know at halftime, if we executed better on offense, we'd be up by 20,” said Huntington North coach Craig Teagle, whose team led 18-0 before Norwell's Levi Leidig hit a 3-pointer and Will Geiger made two free throws to end the half. Norwell's Garrison Brege hit a 3-pointer to open the second half and pull the Knights, who had been tied with Huntington North for second place in the NE8, within 10 points. But Sawyer Stoltz, who scored 10 points for the Vikings (15-3, 6-1 NE8) in the first half, immediately followed up an old-fashioned three-point play on the other end. After that, the Knights (11-7, 5-2) were never able to close within 10 points. Stoltz finished with a game-high 20 points and had more points than Norwell had as a team until the end of the third quarter. Teagle was also pleased with the way his 6-foot-5 forward guarded Norwell's Will Geiger, who scored just once from the field. Hank Pulver scored 12 points for the Vikings, and Trey Williams had seven. Levi Leidig led the Knights with 10 points, and Brege and Geiger each had eight. East Noble (16-2, 7-0) clinched its second straight NE8 title with a win over New Haven on Friday, while Huntington North took over sole control of second place and Norwell slipped to third. Friday's game was the first in a four-game gantlet for Huntington North, which will play South Side at Huntington University today, Carroll on Tuesday and at Plymouth next Friday. “These next three games are really, really tough, so it was important to have a good start tonight, get off on a winning foot in this stretch,” Teagle said.